January 1972. Resenting his unexpected fame and suffering from severe writer’s block, America’s premier “gonzo” journalist decides to reinvent himself. He creates a new persona–Uncle Lono– and hatches a scheme to return to his roots, reinvigorating his patriotism and his writing in the process. On a freaked-out journey to Arkham, Massachusetts, and the 1972 presidntial primary, evidence mounts that sinsiter forces are on the rise, led by the Cult of Cthulhu, and its most prominent member–Richard M. Nixon! Will the truth set Lono free or simply drive him insane? Hunter S. Thompson and H.P. Lovecraft were two very influential writers from two very different times. Though they shared no commonality in the genre in which they wrote, the two authors always seemed to have a way of captivating my literary attention. Lovecraft, a writer of cosmic fear, never let us forget that we were an insignificant force in this universe. His writings in the early 1900’s helped to define the weird genre and opened up doors to aspiring writers of fiction. Thompson wrote to an already fearful generation that craved information, no matter how twisted it was, about the world at war and how insignificant the American dream and its people were to the white collared swine in charge… Namely Nixon. Both wrote in times of war, and held correspondence with numerous folks. When standing back and seeing some of the silly similarities they share, along with some of the serious ones, I find it unusual that Lovecraft passed away March 15th, of 37′, and Thompson was born 4 months later on July 18th. Now I like to entertain the idea of reincarnation, mainly because the thought of continuing to another life intrigues me, so I always thought it would make for a smash-up story if somehow Thompson was the reincarnation of H.P. Lovecraft. Bad news is im too late. 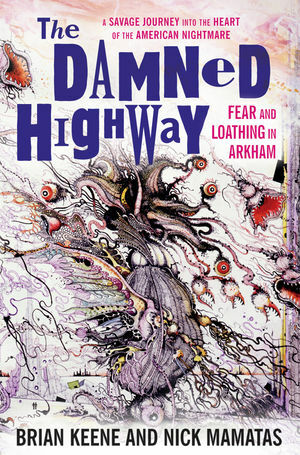 Good news is Brian Keene and Nick Mamatas, another pair of great authors qualified for the job, have collaborated to create, The Damned Highway: Fear and Loathing in Arkham . Though there is no connection of the two’s death/birth dates made in the book, I finished the last page and closed the book with a grin on my face. Fans of both Lovecraft, and Thompson, it seems, are pretty picky when it comes to new additions to either Gonzo writing, or to the Cthulhu Mythos. Granted, Hunter S. Thompson fans are a little harsher to those breaking into the art, both sides seem to be fairly happy with what Keene and Mamatas have produced. I have been reading both H.P.L and H.S.T for years, so I was no newbie to some of the references Keene and Mamatas successfully pulled off with a strange grace. The mastery of Thompson’s language. Perfectly sewn-together plot of Lovecraft’s Cthulhu Mythos into Thompson’s time during the 72′ election campaign. Interweaving truth like Senator Eagleton’s electroconvulsive therapy, and exposing how it was connected to an occult ceremony that had gone awry. The story took a little bit to get jiving for me at first. The plot was always moving, but some of the begging of the book was slow and seemed a little heavy the usual Hunter S. Thompson references. But after trudging on I kind of felt that it was needed for those who might not be well read in Thompson’s work and his view on the world. Even still I would recommend reading some of both H.P. Lovecraft and Thompson’s work, or at least looking them up and reading about them and their life. From dead peacocks, to fungi from Yuggoth. From Woody Creek Colorado, to Arkham and Innsmouth Massachusetts. This book fully satisfied that weird little hunger pain I get from time to time for Lovecraftian fiction. Especially Lovecraftian fiction that is seen and heard through the eyes and ears of Hunter S. Thompson. In the end I recommend reading this one. If you’ve got a small bit of cash and some time to spare, I’d say sit down with this baby and learn how Nixon almost succeeded awaking Cthulhu and damning us all. 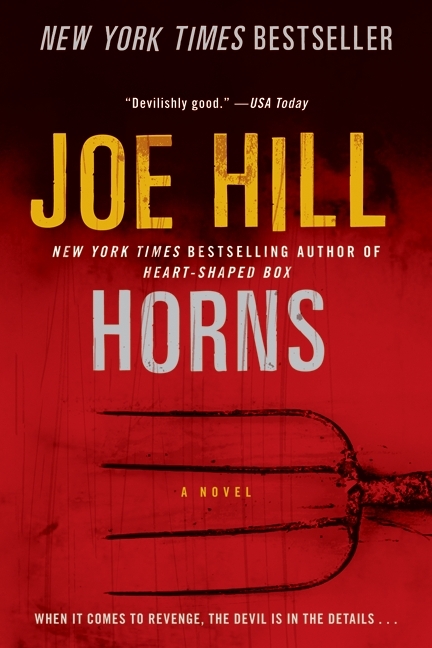 Next on the docket is Horns by Joe Hill. Stephen Kings kid gets a shot at showing us how twisted his mind has become. You know, being raised by King himself…might be interesting. This entry was posted on October 16, 2012 by David Joseph. It was filed under Books, Reviews and was tagged with Book Review, Cthulhu, H.P. Lovecraft, Horror, Hunter S. Thompson, Science Fiction.